If you want glitz and glamour, Giuseppe Zanotti has it all on offer this season with a range of metallic colours and jewels on show. You can definitely find a plain shoe in his collection, however his style is all about standing out and making a statement. This season, Zanotti’s sandals includes beautiful intricate designs with gold definitely making a huge appearance in both the heels and flats. 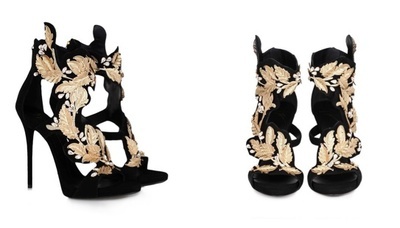 My favourite this season are the black suede heels with crystal and gold leaf filigree detail. This shoe will go with any outfit thanks to its dainty style and detailed features. Gold, blue, bronze and silver metallic pumps are all popular this season. Points are the stand out in this collection, but don't be fooled there are also peep toe pumps available. As the collection runs with the European season, Zanotti offers a range of boots for their cooler months. Pumps or flats, there is a diverse range and although his collection encompasses metallics and crystal appliques, you can find plain black leather styles that will stay in fashion for years to come. Although his collection is aimed at women, he does have a small range of men’s shoes. His designs are just as eccentric as those from his female collection, with a range of prints, zips and buckles. His sneakers also meet the criteria with metal gold plates and buckles. His designs are great for men that like to wear shoes that have character and tell a story. This year has marked Giuseppe Zanotti’s 20th anniversary. To celebrate this monumental achievement, Zanotti has created four limited edition styles which all have distinct characteristics. His first design ‘Jewel’ was released in June. This pays tribute to the element that has always been used in his creations. His second design ‘Rock n Roll’ was released in September, paying tribute to the music vibes of his collection. At the end of November ‘Black Stilettos’ will be released showcasing the journey this style of shoe has gone though. Last but not least ‘Disco’ will be released in February 2015. This collection expresses his constant source of inspiration he has received from clubs. Giuseppe Zanotti has a range of inspirations and creates shoes that make men and women feel great.